American Psycho is another novel that I read after watching its film adaptation first. I saw it several years ago and it made a big impression on me then. Christian Bale portrayed Patrick Bateman really well, his cool demeanor contrasted really well with the scenes in which he seemed to act out of character. The film was violent and shocking but I was puzzled by the unambiguous ending and wanted to find out how it happened in the novel. 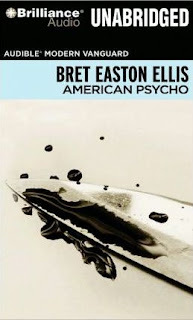 I was in for a shock as American Psycho is one of the most violent books I've ever read. It is set in the 1980s portrays high life of yuppies living in Manhattan during the Wall Street boom. The protagonist, Patrick Bateman, is a 26-year old successful banker. He is also the narrator. Bateman talks at length about his complicated daily routine and very precisely lists all the health products he uses as well as workout routines he follows. This presents him as a person who might be suffering from some kind of obsessive-compulsive disorder. His work is probably stressful (though we never really get any significant insights into what he actually does), so he often meets with colleagues at fancy restaurants. Their conversations are usually completely meaningless and they often fail to recognize other people they see there. It can also indicate some kind of psychological problems (or even suggest that some of the events described by the narrator don't actually take place). I prefer to believe the latter as there are fragments that are really hard to read. There's a lot of violence towards women and, which I found even worse, cruelty towards animals. Bateman presents himself as stone-cold, emotionless being “...there is an idea of a Patrick Bateman, some kind of abstraction, but there is no real me, only an entity, something illusory, and though I can hide my cold gaze and you can shake my hand and feel flesh gripping yours and maybe you can even sense our lifestyles are probably comparable: I simply am not there." This presents him as an unreliable narrator and further strengthens the idea that only some (if any) of what he describes actually happens. The ending is slightly different than the movie one and I actually liked how the abrupt "This is not an exit" sign is used as the final line of the book. I know that the novel has been received well by the critics who often see it as a prime example of post modern fiction but for me it just felt too chaotic and violent to be enjoyed thoroughly.